Calling all the mums out there…this one's for you! Being a mum is a full time job, but we've got a little something fun for you in the free time that you do have! 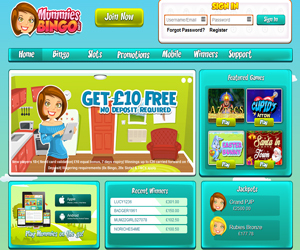 Mummies Bingo promises FREE bingo games everyday with real cash prizes to be won! There are loads of games to choose from, along with some great promos and bonuses. Sign up to get your £15 FREE no deposit bonus, and then when you're ready to fund your account, you will get a 500% Welcome Bonus on your first deposit! Whether you prefer to play 30 ball, 75 ball, 80 ball or 90 ball bingo, Mummies Bingo has something for everyone, with some tickets going for as little as 1p! If bingo isn't your number one choice, there are also loads of scratch cards, casino and slot games. You can play Blackjack, Keno and Roulette, and spin to win some of the most popular slot games online, including Lucky Devil, Mystic Wilds and Honey Bees. Mummies Bingo has a great variety of games so you're bound to find something you love! Mummies Bingo has some fab promotions every day of the week! Make your Thursdays that much better with ‘Thank God It's Thursday' – bingo on an odd number or spin 3 or more of the same symbol in a winning line to get an extra 10% bonus on that day's deposit. ‘Super Sundays' promises great bingo prizes when you deposit between £10 and £90. If you deposit £40, for example, when you bingo on 40, you will win £40 worth of bingo tickets! That's not all, though. Every time you play bingo and slots, you will get 20% Cashback on your weekly deposits. PLUS, who doesn't love Happy Hour? There are 8 Happy Hours each day where Mummies Bingo will treat you to extra bonuses. When you join Mummies Bingo Mobile and you’ll instantly receive £15 FREE with no deposit required just for signing up. You can enjoy seamless gameplay on the go via your Apple iPhone, iPad, iPad Mini or Android Phone and Andtroid Tablet. In addition to the fabulous welcome bonus, there’s also an absolutely stunning series of deposit bonuses worth 900% on your first three deposits. Mummies knows all of you mums out there are always on the go, so take Mummies Bingo with you! Play a large selection of slots and casino games anytime, anywhere and you’ll never miss a win! Someo of the top games available include Queen of Legends, Rubies and Sapphires, Treasure of Egypt, roullete, blackjack and of course keno!